(Part 2 here) This post was originally written for Tuesday, but since it's a two-part post, I held it over til today so that the two parts wouldn't be split by the holiday. I was cruising Pinterest and I saw THIS POST about saving money. I immediately went to it to see what she had to say. While it was a wonderful post, for someone in my situation it wasn't very helpful. I'm about 90 times cheaper than she is, haha! It seems like a great list for people who make a good wage/large family situations. So definitely check it out. However, for us, we're just on a tight budget. Late twenties, young marrieds, whatever category you want to put us in- we're just starting out in life. Maybe that's your category, too. Or maybe you have gone down to being a one-income family. Or maybe there's a job loss. Or maybe the economy just stinks! There are a zillion reasons to cut your budget. Even if you aren't in any of those categories, hopefully these two posts will help you save more money so that you can use it for something bigger! If you're wondering where all of this came from- it's personal experience. My parents are really cool. They're very good + responsible about how they handle money, and as a by product, they have the ability to be generous. I love that about them. My mom comes from an *extremely* frugal family. I think there isn't another family in the world that knows how to get the most out of a single penny. Her father, my grandfather, taught me the value of a $20 bill. I used to tell him it wasn't much money at all. Now I realize how wrong I was. So between how I was raised + learning by necessity, we are able to live very happily and comfortably on a tight budget. And I want to share that with you. 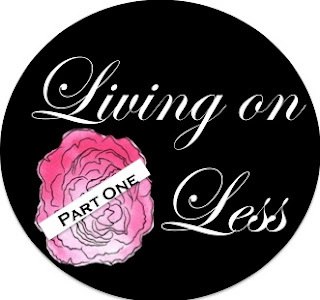 I really struggled with which part should go first- the philosophical/mindset post about living on less or the budget tips. In the end, it seemed that if you know the mindset, it's easier to follow the tips. So, mindset wins! Of the 50 tips/tricks I wrote down, only 4 were about our mindset or mind tricks. I'm really not sure how to label these? The other 46 (coming tomorrow) are more practical/budget related. Try to really let these sink in, though. Sometimes changing your mindset about money is all you need to make a difference in your budget each month. Anyway, it has been really helpful for me, hopefully these little mindset changers will help you live on less, too. (1) Before you buy, wait! Have you ever *just had to have* something? And then maybe you get distracted if it's an online purchase or you have to wait til the next paycheck and in the end, you forget to get the item at all? Sometimes if we will wait a bit, we discover that what we absolutely thought was necessary, isn't that big of a deal at all. I've experienced that a lot with clothing, if we're being honest. Most of the time, I can tell myself that if I still want it and it's there next week, I can have it. And by the next week I don't want it or need it anymore. Try waiting for a certain amount of time before buying your next "want" vs. "need" purchase and see what happens. (2) Want vs. Need. Speaking of which, learn to identify wants versus needs. We are so blessed that we often label things we want as things we need. Do I really need that 7th pair of jeans? (notice how everything goes back to clothes? haha!) Probably not. In fact, there are only a few pairs that I even wear on a regular basis. If you ask yourself, "do I really need this?" you will often be able to answer, "no" and make the urge to buy a lot less great. (3) Think long term. I read a little pin on pinterest that said, "Don't sacrifice what you want most for what you want now." ...um... brilliant. How often have I nickel and dimed myself out of the money to buy something really great or meaningful. My dad has always said to me, "you can thirty-dollar yourself to death" whenever I would say, "it's only 30 (or 10 or 20...) dollars!" and it's so true. When we're on a budget, we often buy lots of less expensive things. Five dollars at target, a 10 dollar sale item, so on and so forth, forgetting that very quickly the small items add up to be really, really huge. It's an odd mind trick, really? I've left the mall before thinking I'd spent only $20, without realizing that I'd spent $20 and 5 different stores! Little purchases play tricks on your mind, making you think you've been frugal when you really haven't. Cut out the "right now" gratification purchases and think long term. (4) Look outside our borders. This is the biggest one for me, and the most helpful. We who live in America are so blessed. Beyond our wildest imagination. If you've had the opportunity to go overseas and see how others live, you already know this. If you haven't, take full advantage of the internet and start googling 3rd world countries. Wow. Some of the things I've seen were so shocking, I wonder if the image will ever be dulled or dimmed, even decades later. When we realize just how much we already have, we will want so much less. I don't want to say too much about this because I'm afraid of coming off as depressing, but it is something to remember. We just keep giving ourselves more and more and forgetting that the vast majority of the world has nothing. Nothing. I can't even say the word enough. Whenever I start to feel like I haven't got enough, I remember just how much we actually have, and it really does satisfy the urge for "more" that we have to constantly battle in America. Because hey, just because we *can* have something, doesn't mean we should. Simple, right? I hope it comes off nicely. This was the hardest blog I've ever written? It was really difficult to translate these thought processes into written form. Losing tone + facial expressions makes me worry that my intent will be taken the wrong way, especially with number four. I'm just going to leave it at that, haha! Check back tomorrow, the blog will be full of 46 (or more) ways that we save money every month and how we manage to live so well on so little. I hope your heart is light and your wallet is heavy! As always, thanks for reading. Good post, I think nr 4 is very true. Thank you, Shelly! I was really worried about how it would go over. we are frugal compared to most people we know - we gave up satellite tv, use the library for books, music and dvds, we rarely splurge on vacations, we drive old beat up cars and are thankful for them. i know we are so lucky compared to so many! looking forward to your next post! I feel you on ending up at budget articles that don't apply to me or my situation. I'm already cheap, so all the 'Stop going to Starbucks' type stuff is just silly. But you know, my husband could probably $20 us to death if I didn't keep an eye on it! WISE WIsE WISE<<<>>> keeping it quite simple, Yet SOOOOO DEEP< souls are definately "scratching below the surface", LOVE IT<> evolution of consciousness,,,,,, understanding just how "emotionally, and impulsive creatures we can be, and the differance in "knowing", just what truly brings us joy and happiness,individually,love that "pinterest" and blogs reveal so much through word and picture,about we beings ,,,,,,,,,,,,,,, feels goood and looks good, the view, from upon that next branch of the "tree of life" GREAT ARTICLE SISTA!